Worldbuilding is an essential part of any work of fiction. But especially for science fiction or fantasy, it's the lifeblood of storytelling. But when worldbuilding fails, it can wreck your whole story, and leave your characters feeling pointless. 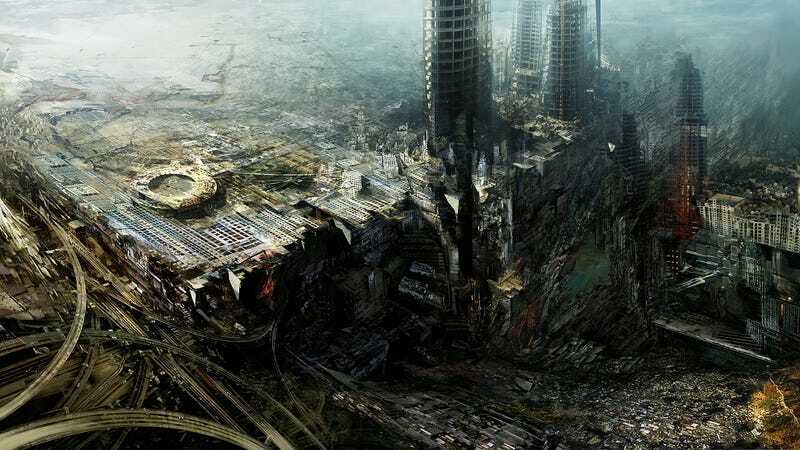 Here are seven deadly sins of worldbuilding. Top image: Under Tomorrow's Sky by Daniel Dociu. 1. Not thinking about basic infrastructure. How do they eat? What do they eat? Who takes away the garbage? Who deals with their bodily wastes? How do they get around? What do the majority of people do to survive? You're not just constructing a society, you're creating an economy. People don't oppress each other for fun — usually, systems of hierarchy and oppression have an economic component to them. Maybe you need a lot of peasants to grow labor-intensive crops, or maybe you need lots of cannon fodder in your space war. Maybe your only source of protein is a weird fungus that needs to be tended by specially trained people. Maybe everybody's eating algae. In any case, there's nothing worse than a fictional world where there are elaborate social structures, which seem completely separated from the realities of food, shelter and clothing. 2. Not explaining why events are happening now. Chances are your story revolves around all heck breaking loose in your fictional world. (Or your fictionalized version of the "real" world.) One major worldbuilding flaw is not explaining why heck is breaking loose now, as opposed to 20 years ago or 20 years from now. Why is the dark elf army showing up now? Was there something preventing them from showing up, which has been removed? Will it be too late if they wait another year or two? Often, if your plot is swinging into motion for reasons that feel purely arbitrary, that's actually a failure of worldbuilding. You haven't fully accounted for the things that kept your villain in check, and probably also for the factors that keep other political actors in your society in check as well. And that's a larger issue — every society has checks and balances. Even an absolute monarchy has invisible lines the monarch can't cross. Sometimes you can't figure out how these checks and balances worked in a particular era, without reaching beyond the official history as sanctioned by the people in charge. On a related note, if you're drawing on real-life history, for your fantasy world or your future history, don't just read works by historians from the dominant culture, or works focusing on the ruling class. Historians have done amazing work on discovering what ordinary people and marginalized groups were doing during a lot of eras, and there's plenty of resources on what was going on in, say, the Middle Ages outside of Western Europe. To the extent that you rely on actual history in your world-building, you should reach beyond the Kings and nobles of a few Western countries. Image by Frederic St-Arnaud/CG Society. This is a huge problem that tons of creators seem to struggle with. But as a rule of thumb, if you want to have Belgians in your novel, you're going to have to try and create an accurate view of Belgian society. If you decide that instead of Belgians, you're going to have an alien species called the Bzlgizns — who are basically Belgians except they've got antlers — you still have to try and make them well-rounded and as nuanced as possible. Ditto if you're creating a secondary world where there happens to be a land of magical creatures called The Belge, who are still basically Belgians. Really, you should make sure that any cultural or ethnic group you create has multiple dimensions and a sense that its members have their own subjectivity, and a believable culture. Whether it's the culture that your main characters come from, or a culture that they see as the "other." But it's also a really good rule of thumb that the more your fictional group resembles real-life Belgians, the more you ought to worry about being true to life. Changing "Belgians" to "Bzlgizns" doesn’t actually let you off the hook for presenting a true-to-life portrait of people from Belgium. 4) Creating monolithic social, political, cultural and religious groups. Everybody in a particular ethnic group agrees about everything. Every member of the ruling class, or the working class, agrees about everything. Every citizen of a particular nation holds exactly the same set of opinions. There is one version of history that absolutely everybody agrees on. Every member of a religion interprets the tenets of that religion in exactly the same way. That sounds plausible, right? Maybe if you've never been around actual humans. In real life, if you get three members of a particular in-group together, you'll probably hear four different opinions on most of the group's major concerns. Asserting that all Christians agree on all matters of doctrine is probably a good way to get laughed out of the room. So when you imagine the ruling class of your world, it's safe to assume that no two members of it will agree on much — and when you retell your fictional history, remember that nobody's likely to agree on what actually happened. Image by MacRebisz/Deviant Art. 6) Not really giving a strong sense of place, like what it smells like after it's been raining. 7) Introducing some superpower, like magic or insane tech, without fully accounting for how it would change society. If your pitch is, "It's just like our world, except everybody can turn invisible at will," then you've already failed. Because if everybody could turn invisible at will, it wouldn't be anything like our world. Especially if this power had been around for more than a few months. Whether you're creating an alternate history or a secondary world or a far future, any technology or power you introduce is going to have far-reaching effects — not just first-order effects, but second- and third-order effects, too. Going with the "invisibility" example, you'd have people using it to spy on each other — but you'd also have a huge boom in heat sensors. We'd start redefining the whole concept of privacy, and pop culture would be massively transformed. There would be whole art forms based around invisible performers, and it might be legal to shoot an invisible intruder on sight (on smell?). You could be here for hours imagining all the ways that the universal power of invisibility would change the world, and you'd probably still just be scratching the surface.